2018 was a revival year for us. When the year opened, who knew what it carried for us in its magical box. As we stand in 2019, it feels like a roller-coaster ride when we look back at the 365-day journey of the year 2018. Not only OnGraphers but also our clients found their favorite moments from the previous year. They are proud to be a part of this incredible journey. We passed several challenges throughout the year that demonstrated our strength of forwarding thinking and the winning strategy across multiple engines of OnGraph Technologies. The number of milestones we achieved in the last year is encouraging and sets for us a base to further build our success story in the upcoming years. The successes and achievements reaffirm our unabating commitment to quality, customer satisfaction, technology, and philanthropy. Our growth was fueled by our diversified Portfolio. Throughout the year we were very busy, but we are delighted. Here, we invite you to have a peep into this brief account of our last year’s highlights and successes. Don’t be surprised seeing us adroitly gaining an edge across all aspects of our business, in 2018. We have planned double for 2019! Last year, we marked “a decade of excellence” in the area of mobile and Web Application development and innovation. This very first milestone of the year is a testimony to our persistent effort towards innovation, our deeply rooted core values, and our challenger spirit. We also welcomed us to a new decade with loads of wishes and offered us a grand celebration organized in the city Agra – home of the iconic Taj Mahal. Both of our development centers, based out of Noida and Jaipur, united to make the occasion enthralling with their dancing, acting, and singing. We partied hard, distributed awards, took selfies, laughed hard and revived our commitment as a family to continue pushing our boundaries and leading the game. We do understand that the choices we make will have an impact far beyond our business. We made such choices, and it paid us back very well. Our business footprint reached to 20+ nations. US, Canada, Western EU (UK, Sweden, Spain, Belgium, France, Italy), Australia, New Zealand, Malaysia, and the Middle East are a few among them. Clearly, as we told you earlier, we were really busy throughout the year. The year grant us other proud moments. World’s top B2B Reviews and Rating websites AppFurtura recognized us as a leading Web and Mobile app developers among World’s top 20 companies. On the other hand, “Clutch” – World’s leading B2B market research organization – featured us among “Global Leaders for 2018“. We were also exhibited and interviewed at MWC and TechXLR8 for our thought-provoking development ideas and innovations. We kicked off the year winning blockchain projects. As a dynamic and growing software solution provider, we learned and honed our skills, and started development services around AI-powered chatbots and RPA. We developed 8+ POC and decentralized apps for start-ups and top leading brands. As the applications deployed well, we are looking forward to sharing our exciting portfolio and Case-study in 2019! While the business side of us was flourishing continually, we didn’t let the human side to be retracted inside the layers of business, business, and business. As we wear “Corporate Social Responsibility” on our sleeves; thus spread smiles on the faces of children. 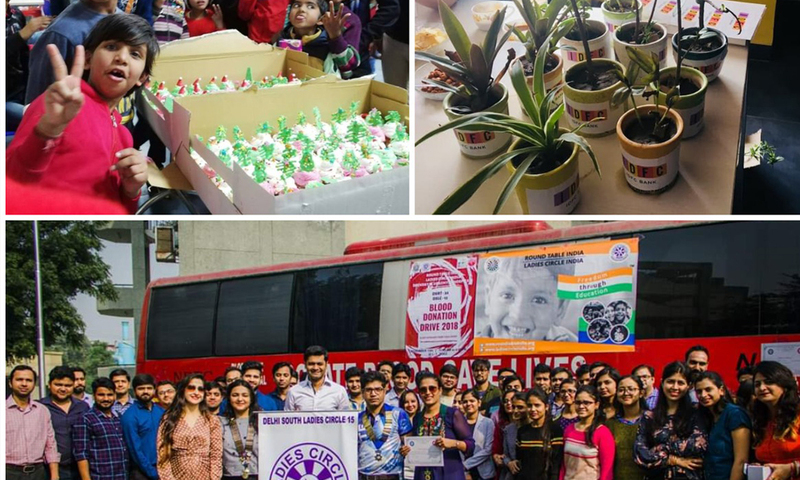 We supported Orphanage and invited children to our development and delivery office in Noida. We became Santa for them. It was a true bliss seeing a bundle of joy with twinkling eyes when their wishes came true. They enjoyed cakes, toffees, music, dance, and dinner with us. And, we lived our childhood once again. For another noble cause, a blood donation camp organized at Noida Headquarters. Moreover, on the world-environment-day, a small activity performed to show care and love for plants. We feel proud to be an active contributor towards society and saving lives. We drank 50 million cups of coffee, digested 30,000 Pizzas and burnt those extra calories in 50 + Dance Parties. We celebrated every success, birthday and anniversary. The 100+ Team Parties boast the critical milestones we reached. The multiple outings – all as a family – speaks words about our knack for maintaining a work-life balance. We value the diversity of people and aspire to foster our heritage of respect for people, culture, thoughts and the environment. Stressing on our founding values to operate responsibly, we organized, participated and enjoyed 10+ festivities. Gifts distribution in Diwali to spreading colors of happiness in Holi, replenishing our stomach with vermicelli in Eid Celebrations to raising our patriotism on 15th August, participating in the decoration and spreading happiness on Christmas to Dancing on Bhangra on Lohri and Flying Kites on Makar Sankranti, OnGraph Family enjoyed all of it – together. In the year 2018, not only we added a new location on the map, and we moved to a bigger and better place. Our development center in Jaipur gave a bid to their old workplace and shifted to a new office building to give wings to thoughts, challenge every innovative technology and foster easy collaboration with clients and among us. With a view to fulfilling the growing needs of all our stakeholders, we opened a new development center in Noida as well. We are among the leading IT companies, not only because of our advanced development and love for technology but also due to our unique approach to connecting with clients. Therefore, we opened a sales office at a prime location in London. OnGraph is growing from strength-to-strength. We think the time is just right to take stock of how far we’ve come, but all would be remiss if we do not thanks and appreciate the central and pivotal role played by our clients, partners, and employees in our continued business success journey. We are proud to cultivate such great partnerships and relationships. We cannot wait to help our new and esteemed customers solve their IT challenges and address their software needs in 2019.